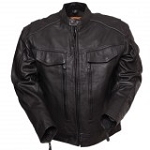 Motorcycle Leather and Textile Riding Jackets for the protection of the elements everyone encounters when cruising down the road. Leather Jackets have long been the standard of the Biker. At Lutzs Leather we carry a variety of styles, sizes and type of Leather.